"The loss of biodiversity is threatening ecosystem productivity and services worldwide, spurring efforts to quantify its effects on the functioning of natural ecosystems," said lead author Jingjing Liang, a forest ecologist from West Virginia University. Ecosystem services include any positive benefit that plants and animals provide to people including food, fresh water, raw materials and medicinal resources. 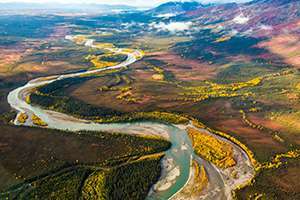 A team of scientists, led by Liang, and using data from Alaska's boreal forests developed a model that measures and quantifies the effects of plant productivity resulting from a loss of species diversity. Previous research focused the positive role biodiversity plays on resource acquisition by plants. "What also differs our study from previous research is that we developed a theoretical model to quantify the influence of biodiversity on plant productivity at individual plant and community levels," said A. David McGuire, an ecosystem modeler with the U.S. Geological Survey and University of Alaska Fairbanks' Institute of Arctic Biology. "This model enables the scientific community to better integrate biological conservation in natural resource management." While the world struggles to reduce the loss of biodiversity, concern is mounting over the ongoing relationship between biological conservation and poverty, especially in rural areas where livelihoods depend heavily on ecosystem resources, say the authors. "The development of our ecological model was inspired and aided by an existing economic theory," Liang said. According to co-author and WVU economist Mo Zhou, the theory of diminishing marginal productivity in the context of ecology, indicates that marginal resource productivity will at some point decrease as resource acquisition increases. "We demonstrate that conserving the diversity of plant species may help to maintain ecosystem services for current and future generations," say Liang and Zhou.